Please note that the student lists for each counselor have changed. See the changes below. This month we will be giving the ACT make-up on March 12th. Our Senior class is receiving lots information about graduation, it won’t be long. March is Social Worker’s appreciation month and Women’s History Month. 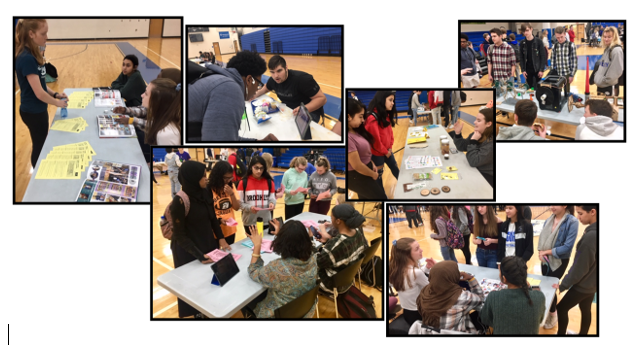 Students were offered to attend the Elective Course Fair last month. Pictures are below. It was awesome! 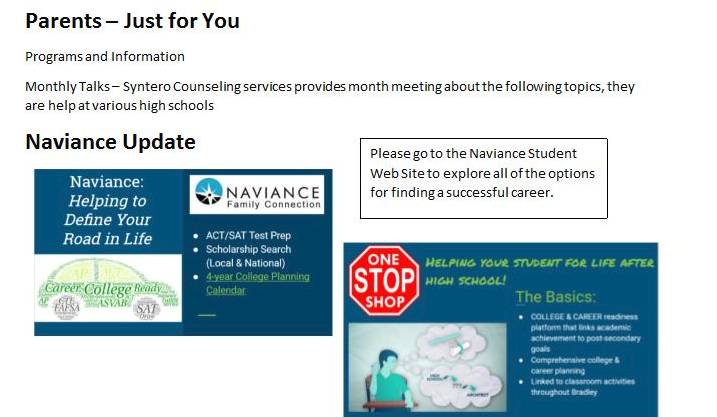 The school counseling department is working on improving the emotional health of our students by providing several programs that help students be proactive about their emotional health needs with preventive programs. We offer in class and group counseling programs. 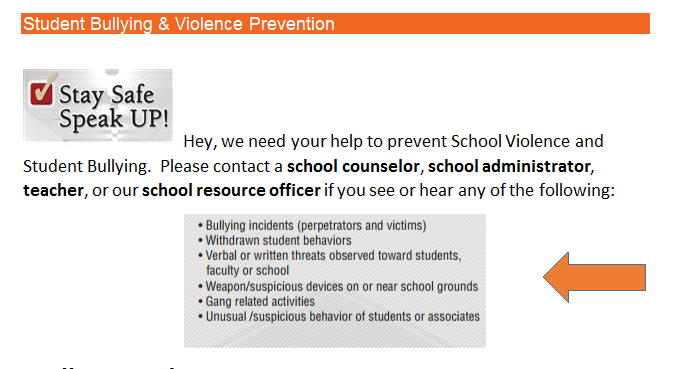 The goal is to teach techniques that deal with the issues of today teens in a positive proactive manner. The groups are based on the needs of the student population. These groups will help students continue to build important skills that will better manage symptoms of depression, anxiety and stress management. The groups will also focus on improving motivation and organization skills through various activities, role-plays, and games with their peers. Being in a group setting is a positive experience, as they provide a greater support network for students. Jessica Buscemi received her undergraduate degree and Master of Social Work from The Ohio State University and holds a Master of Education in School Counseling from the University of Dayton. Her first job after graduate school was helping families through a local elementary school obtain resources related to homelessness and housing. This is where her love for working in education grew and Jessica began work at a local high school working holistically with students. Jessica is married to her husband Rob and has two children – Leo and Lucy. Other than her family and working with students, Mrs. Buscemi has passions for donuts and traveling! Krista Holt has been in education since 2004. She received her Bachelor’s Degree at Eastern Michigan University and her Master’s from the University of Toledo. She lives in Marysville with her husband, Jarrod, daughters Sawyer and Josie and sons Uriah, Titus, and Elias. 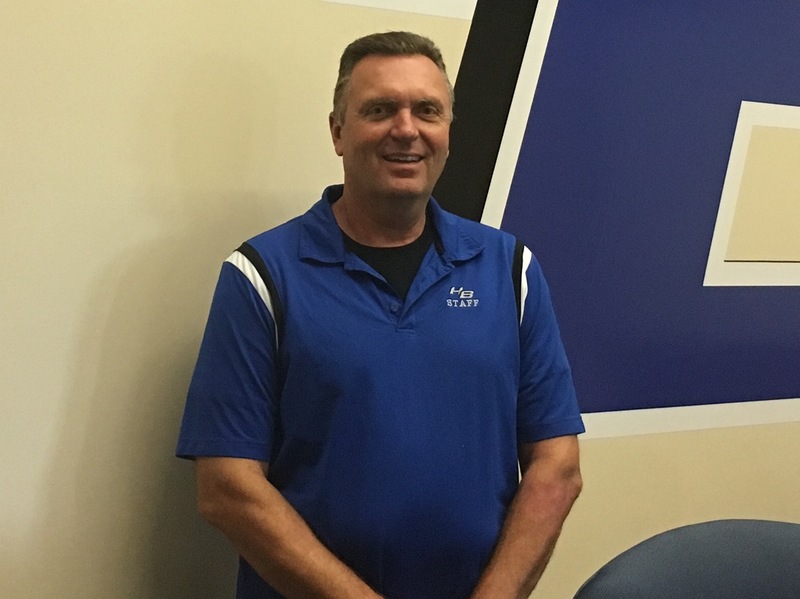 Eric Cable has been in education for 20+ years and spent 8 years as a counselor at Hilliard Darby High School before coming to Bradley High School in 2009. Eric received his Bachelor’s degree at The Ohio State University and his Master’s degree from the University of Dayton. Eric lives in Worthington with his wife, Kelly, and his son Austin. Chris McCabe has been in education for over 25 years and the last 17 in the Hilliard City School District. Chris has taught science in the Cincinnati Public School System, Hamilton Local School System, and the Hilliard City Schools. He has been an intervention counselor, senior Capstone coach, freshman team teacher, tennis and basketball coach, and various other teaching assignments during his career. Chris received his Bachelor’s degree at The Ohio State University and his Master’s degree from the University of Dayton. Psychologist: Melanie Hartle received her psychology undergraduate degree from Gannon University in Erie, Pennsylvania and received her educational specialist degree in school psychology at Youngstown State University. Melanie is married to her husband Andrew and has three fur babies. She is a currently the Girls on the Run coach at Brown Elementary School and is a member of the running club, Love to Reach (L2R).